As the name indicates, micro aims to be somewhat of a successor to the nano editor by being easy to install and use in a pinch, but micro also aims to be enjoyable to use full time, whether you work in the terminal because you prefer it (like me), or because you need to (over ssh). Here is a picture of micro editing its source code. To see more screenshots of micro, showcasing all of the default colorschemes, see here. You can also check out the website for Micro at https://micro-editor.github.io. By default, micro comes with 16, 256, and true color themes. Although not yet implemented, I hope to add more features such as autocompletion (#174) or a tree view (#249) in the future. To install micro, you can download a prebuilt binary, or you can build it from source. If you want more information about ways to install micro, see this wiki page. All you need to install micro is one file, the binary itself. It's as simple as that! On that page you'll see the nightly release, which contains binaries for micro which are built every night, and you'll see all the stable releases with the corresponding binaries. If you'd like to see more information after installing micro, run micro -version. There is a great script which can install micro for you by downloading the latest prebuilt binary. You can find it at https://getmic.ro (the github repo for it is here). The script will install the micro binary to the current directory. On OpenBSD, micro is available in the ports tree. It is also available as a binary package. If your operating system does not have a binary release, but does run Go, you can build from source. Make sure that you have Go version 1.5 or greater (Go 1.4 will work if your version supports CGO) and that your GOPATH env variable is set (I recommend setting it to ~/go if you don't have one). The binary will then be installed to $GOPATH/bin (or your $GOBIN). Please make sure that when you are working with micro's code, you are working on your GOPATH. You can install directly with go get (go get -u github.com/zyedidia/micro/cmd/micro) but this isn't recommended because it doesn't build micro with version information which is useful for the plugin manager. If you are using MacOS, you should consider using iTerm2 instead of the default Mac terminal. The iTerm2 terminal has much better mouse support as well as better handling of key events. For best keybinding behavior, choose xterm defaults under Preferences->Profiles->Keys->Load Preset. The newest versions also support true color. On Linux, clipboard support requires the 'xclip' or 'xsel' commands to be installed. If you don't have xclip or xsel, micro will use an internal clipboard for copy and paste, but it won't work with external applications. If you open micro and it doesn't seem like syntax highlighting is working, this is probably because you are using a terminal which does not support 256 color. Try changing the colorscheme to simple by pressing CtrlE in micro and typing set colorscheme simple. If you are using the default Ubuntu terminal, to enable 256 make sure your TERM variable is set to xterm-256color. Many of the Windows terminals don't support more than 16 colors, which means that micro's default colorscheme won't look very good. 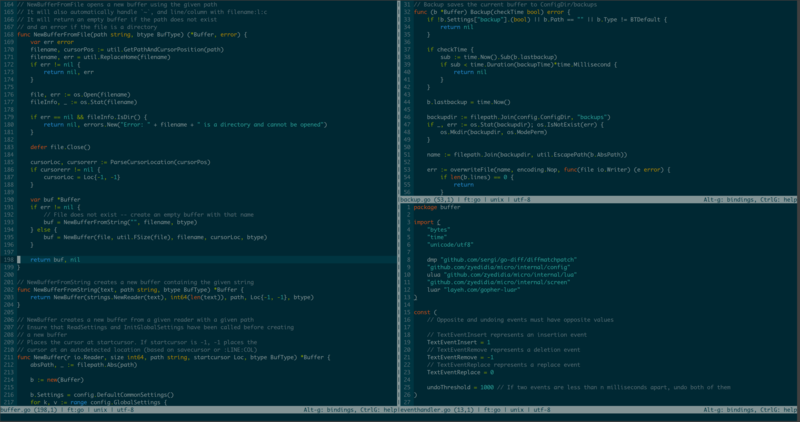 You can either set the colorscheme to simple, or download a better terminal emulator, like mintty. Please note that micro uses the amazing tcell library, but this means that micro is restricted to the platforms tcell supports. As a result, micro does not support Plan9, and Cygwin (although this may change in the future). Micro also doesn't support NaCl (but NaCl is deprecated anyways). Once you have built the editor, simply start it by running micro path/to/file.txt or simply micro to open an empty buffer. You can move the cursor around with the arrow keys and mouse. You can also use the mouse to manipulate the text. Simply clicking and dragging will select text. You can also double click to enable word selection, and triple click to enable line selection. I also recommend reading the tutorial for a brief introduction to the more powerful configuration features micro offers. If you find any bugs, please report them! I am also happy to accept pull requests from anyone. You can use the GitHub issue tracker to report bugs, ask questions, or suggest new features. For a more informal setting to discuss the editor, you can join the Gitter chat.